Our rates are determined by the specific date, time and location of the event. The most popular wedding dates are Saturdays in the months of May-October & December. Discounts are available for events that occur Sundays-Fridays and if they are off-season. Your fee is all inclusive with no hidden costs or fine print. Please call or visit our website for a price quote. Although we specialize in wedding receptions, we’ll perform for any special occasion including anniversaries, reunions, holiday parties, banquets, school dances, bar/bat mitzvahs, theme parties, night clubs, fundraisers, etc. What is your equipment like? We’ve spared no expense to outfit each of our systems with the finest in commercial audio. 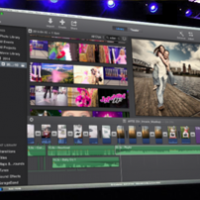 Mackie speakers, Numark mixers, and the latest music software running on Apple laptops are just a few of the features. Our equipment is clean in appearance and completely modular if space is limited. For formal events, it is our policy that no signs or banners are used inside the venue to preserve the look of the decor. We provide a sophisticated lighting system to make the dance floor contemporary and inviting. The lights include the classic ballroom effects along with colored beams that move to the beat of the music. We have thousands of selections including latest releases, dance, pop, rock, alternative, funk, r&b, retro, oldies, country, motown, big band, group participation, dinner music, etc. We only play legally purchased music appropriate for your event with clean, edited lyrics. Definitely! We’ll send you a play list months before your show. Simply highlight the individual songs (not just artists) that you want played and let us know the songs that you positively don’t want to hear. If there is something you want but don’t see listed, be sure to write it in the space provided. If we don’t already have it in our extensive library, you’re welcome to bring your own cds. At the show, we encourage your guests to give requests and we’ll also keep the volume at just the right level for your event. Our djs are professional, experienced, and approachable. 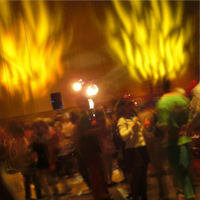 We have a knack for keeping the dance floor full without having to resort to props, costumes or cheesy dance skits. Whether you want the entertainment to be conservative or outgoing, we’ll give you the appropriate personality and adapt to your style. You can also specify your dj’s attire, such as a formal tuxedo, semi formal dress or something a little more casual if needed. Our staff members are always well prepared, very open minded and eager to work with you to make sure everything goes according to your plans. Of course. We will MC the show, do all the introductions and make all the announcements you’d like. On the wedding day, you’ll see us take the lead in coordinating with all of the other vendors so that everyone knows what to expect and the pace continues to flow smoothly. Like most large dj services, the individual dj is not scheduled until the month of the event. It’s hard to guarantee a specific person very far in advance because of schedule conflicts, vacations, or emergencies. The entertainment is one of the key factors that contribute to the success of a wedding. That’s why we are so serious about the hiring and training of all our workers. We make sure that they are the highest paid people in the industry (but we only send one to each show to keep your cost low.) Their happiness with the job reflects the high quality of work that they do. We don’t consider anyone at JAMMIN’ DJs as employees, only as trusted friends. Each of them individually represent our service as a whole when we send them out on the road. A single owner/operator might promise to be more personal and can probably give you a better price. JAMMIN’ DJs is our career, not just a hobby run out of a basement. We all pool our talents and learn from each other. We also have a secure, climate controlled warehouse which houses extensive backup equipment and we keep one dj/manager standing by so that your event won’t suffer if a problem arises. All of our vehicles are reliable and well maintained. So ask yourself if your peace of mind is worth the extra cost. With our mailers, we include a schedule of all our upcoming events. We do many public shows each week at local bars and you’re always welcome to stop by and say We try to discourage people from showing up at private formal events because we’re sure that our clients would expect the basic courtesy of not turning their party into our business showroom. 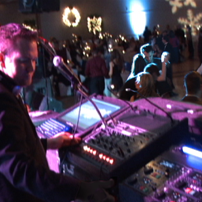 What are the advantages of hiring a dj over a band? For an additional expense, you and your guests can have the chance to become singing stars. We let you choose from thousands of popular songs and provide the microphones, monitors, sound system and lights. 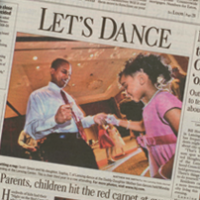 We’ve performed events all over the country. It might cost a little more for mileage and accommodations, but give us a try because we’ll go just about anywhere. 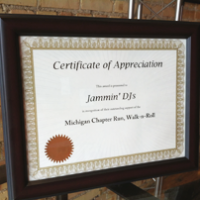 JAMMIN’ DJs was founded in 1991 after Jerry Jodloski graduated from Michigan State University and decided to start his own business in the city he had grown to love through school. Since then, we’ve become the most popular entertainment service in mid-Michigan and continue to expand across the state and nation. We carry extensive coverage including property, vehicle, equipment (even during transport) and a million dollar liability policy. Our current proof of insurance is immediately available upon request. We are more than happy to talk to our clients in person. Our beautiful office includes a conference table for everyone to meet, answer questions and discuss plans. Simply call or email and we’ll send you the paperwork.